Last night I really learned my lesson, when it comes to snacking that is. I recently moved into an apartment building, all by myself. Anyway, last night I’m sitting in bed, watching some housewives hate on each other, when I decide at 11:15 pm that I would like a light snack. I walk to the kitchen, open the lights, and notice two disgusting creatures hanging out in front of my microwave. These little creatures are disgusting, creepy rodents, who eat my windex and makes holes in my wires. I immediately shriek at the top of my lungs as if I had just witnessed a murder. Let’s call them Moe, and Lester. Moe had dissapeared the second I screamed, and Lester was still there after the two second event had occurred. This disgusting rodent looks me in the eye, makes some disgusting mouse noise, and then decides to take off under my microwave. 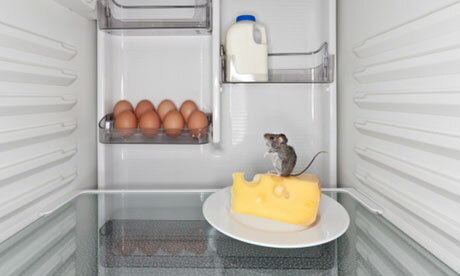 Standing there in awe, and wondering what he’s doing under my microwave, I witness this little pest slide down my wire, and slide right into my fridge, like he was that little sucker Stuart Little. Not knowing what to do, I do what I’m best at. Start crying. Like Lester is going to know that he really upset me or something. I called Ronnie, she was sleeping. I called Donald, he was sleeping, and called up Margaret so have me stay on her couch. While I sincerely appreciated the gesture, I figured I did not want to leave my room in case that little rat decided to come back and haunt me and my freshly painted toes. I spent the entire night, wrapped in a blanket, like a California roll, with the lights on, and music blaring. I googled what scares mice, and I found that they hate loud noise, and lights. Google is my friend. The moral of this way too long story, was that, snacking should never be done after 9:00 pm. I should have never gone to the fridge to go for my snack. However, probably best that I did. I guess I have that little runt mouse to thank after all.